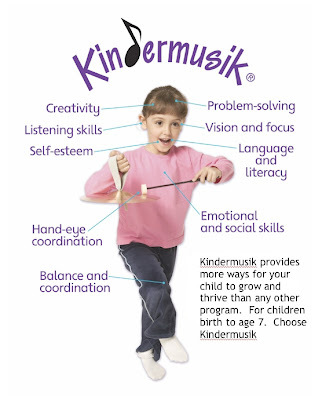 Kindermusik Harmonicas make everyone happy!! What to do while he is at preschool? Make 2010 the year for Music Education - Watch and see why. Family Time provides a dynamic and integrated learning experience for everyone. Younger children delight in the experience and creativity of the older. The older children enjoy helping the little ones learn something new and we all help each other stay safe and happy. Singing. From the first “Hello” song to the last “Goodbye,” exploring a variety of musical styles and genres leads children to find their own voice. Plus singing helps with memory and recall, physical development, creativity, and socialization. Assorted Movement. Whether moving as a family, as a class, or as individuals, Family Time movement activities enhance coordination skills, create opportunities for imitation and exploration, and give everyone something to smile, rock, bounce, or dance about. Story Time. Reading aloud to children stimulates their curiosity, expands their knowledge, and broadens their understanding of language. Family Jam Children (and adults) will love selecting a unique instrument and joining in one big class jam session each week. Musical Concepts. Fun engaging activities bring out the musicality in everyone, from the youngest member of the family to the oldest. Together you’ll learn more about music as you learn more about each other. 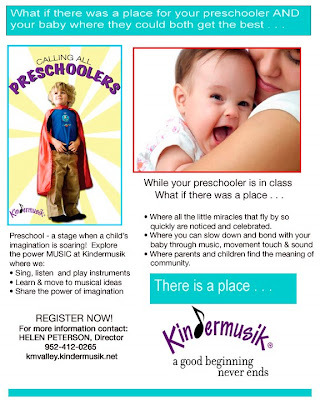 Future Leaders - Kindermusik Graduates. Can't decide whether to enroll . . . watch this. Is Jenny watching this blog? 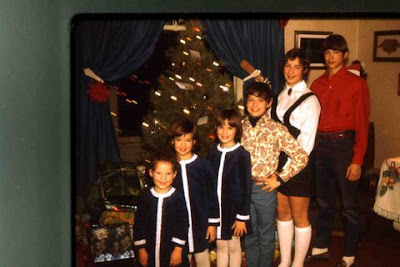 My mom made our clothes and often dressed us as triplets although there is 4 years between us. I don't remember having an aversion to it until we were in California. All dressed in coral tunics, clamdigger pants and kerchiefs. I would love to see that picture now . . . The older kids just got to wear what they wanted. Its a long winter - and we are more than just music! Nice shots of the whole brass family! See how parents and children rate a song. It is really fun - check it out. Here is a recitation of a favorite poem we share in the FEATHERS (Village) class. Many of you have probably wondered about the recording, not like our others, but scratchy and old. Owned and borrowed from the Smithsonian, activist and artist Woody Guthrie performs it for us. Aiden performs it here, enjoy! Welcome back to the KMVALLEY BLOG!